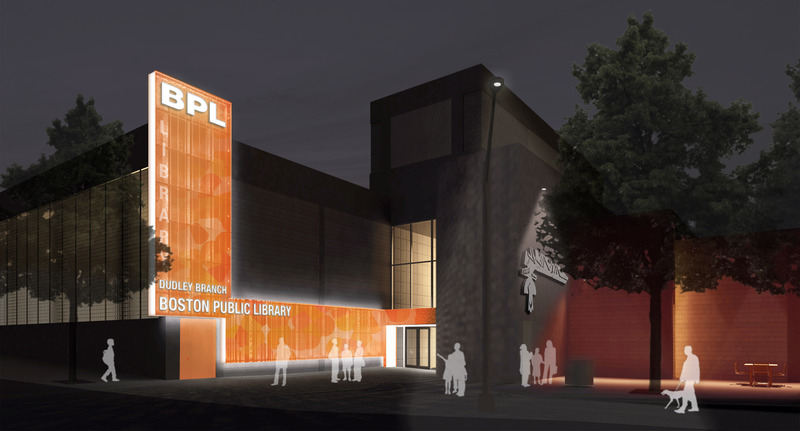 Utile is working with the City of Boston and the Boston Public Library (BPL) on improvements to the Dudley Branch Library. Near-term work includes the design of a wall-mounted signage marquee and improvements to site lighting and amenities. The marquee, which is made of backlit perforated metal, provides clear directional signage to better call out the entry. Work is underway on a comprehensive study that looks at the state of existing facility and outlines new program requirements for the future of the Dudley Branch. Utile and Boston Public Library representatives met on Monday, December 3, with the Community Advisory Council (CAC) to discuss the proposed entrance design and the study. To view notes and images from the CAC meeting, visit the BPL website.